Paperback, 9.5 x 11 in. / 72 pgs / 50 color. Edited by Susan Cross. Essays by Susan Cross and Christine Hoffmann. One of the most significant, funny, and nails-on-a-chalkboard jarring artists of the second half of the twentieth century, Bruce Nauman has expanded the scope of traditional art practice and influenced a generation of artists. He has made himself into a fountain (one-upping Marcel Duchamp? ), cast the space under a chair, fashioned a screeching carousel of carcass-like parts, reinvented the neon sign as a contemporary haiku, and, most recently, recorded the dullness of his studio in real time. His ongoing investigation of our most basic physical, emotional and psychological states has been literally experienced by each of his viewers. 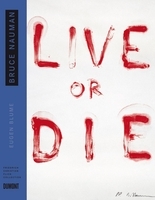 Bruce Nauman: Theaters of Experience is a focused selection of works in a range of media, including sculpture, video, holograms, neon and architectural installations, which examine the artist's use of performance devices as a conduit for heightened self-awareness for both artist and audience. 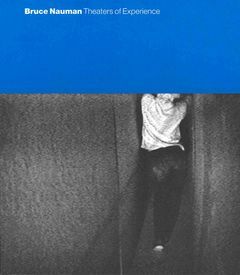 Featuring works from the Guggenheim Panza Collection, augmented with loans from several German collections, the exhibition and catalogue trace the theatrical elements in Nauman's oeuvre, as well as his manipulation of the performer-spectator roles. FORMAT: Paperback, 9.5 x 11 in. / 72 pgs / 50 color.